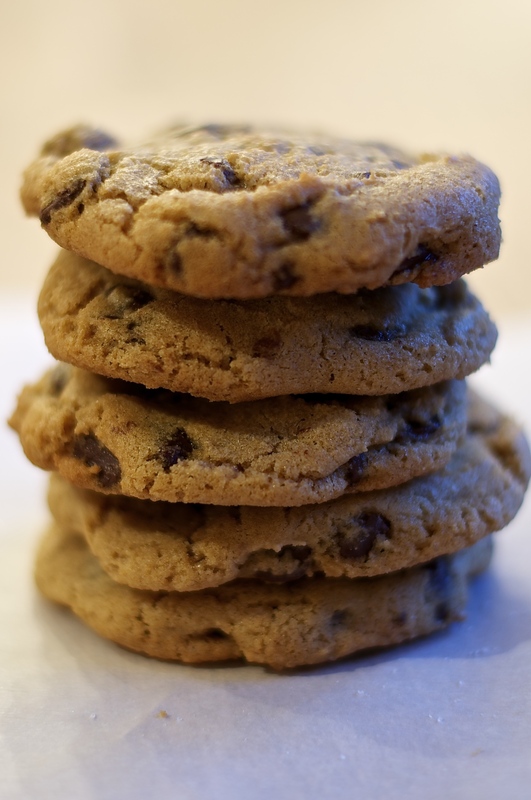 My son loves chocolate chip cookies, so I am perpetually in search of the perfect chocolate chip cookie. He likes these cookies, but I love them. The touch of salt is a perfect foil to the plentiful chocolate. This wonderful recipe is from Savory Sweet Life. The first time you try this recipe, it is important to watch the cookies carefully as they bake – they are so much better if you can get them out of the oven before they brown too much. Don’t be distressed when their appearance changes while they cool. They will crackle more as they fall slightly and will look a touch gooey at first. Try not to eat all of them in one sitting and do share! Mix the baking soda, baking powder, salt, and flour in a bowl. Cream the butter, sugar, and brown sugar in a mixer until it is fluffy (approx. 3 minutes on medium-high speed). Add the eggs and vanilla and beat for an additional 2 minutes until the colour lightens and the texture becomes almost icing like. Add the flour mixture beating until the dry ingredients are fully incorporated. Finally add chocolate chips until well distributed. The cookie batter should be somewhat thick. Chill the batter for at least 30 minutes. Drop about 2 tablespoons of dough or use a medium cookie scoop and plop the batter onto a baking sheet lined with parchment paper. Bake for 12-14 minutes until the edges are nice and golden brown. Remove from heat and allow the cookies to stay on the cookie sheet for an additional 2 minutes. Pick up the parchment paper with the cookies still on top and transfer to a cool non-porous surface. Allow the cookies to cool on the paper for at least 3 minutes before serving.